American Honda is celebrating its 60th birthday in 2019, and as part of that celebration comes the release of the all-new Honda Super Cub. First introduced in 1958, it took a couple years before it came Stateside. Since then, Honda has sold over 100,000 100,000,000 (that’s 100 million) of the little scoots worldwide, making it the best-selling motor vehicle in the history of motor vehicles. 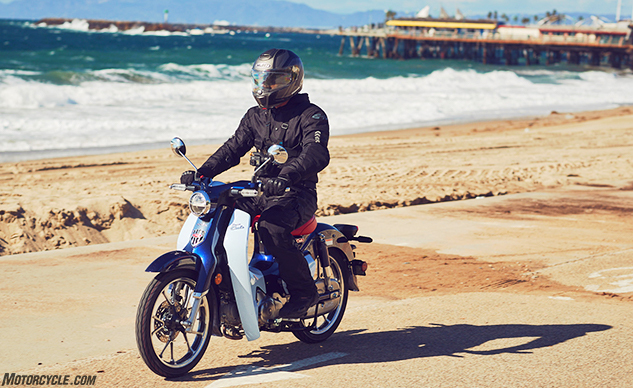 With the new Super Cub, Honda seems poised to keep the sales numbers growing. Taking clear design inspirations from the past, now you can meet the nicest people on a Honda firmly rooted in modern technology. The same 125cc Single seen in the Grom and Monkey scoots the Cub along, but unlike those two minimotos, the Cub utilizes a semi-automatic centrifugal clutch, just like the original. This leaves your left hand free to wave at all the baby boomers who will undoubtedly feel a sense of nostalgia as you roll by. Other modern tech includes a keyless ignition, digital gear indicator and fuel meter, fuel injection, front disc brake (rear is still a drum), ABS, LED lighting, and modern tires. I got the chance to ride the new Super Cub recently on a wet and cold Los Angeles day, and if you haven’t read my First Ride Review already, I suggest you do so. Not only will you get more info about the bike and a short Honda history lesson (and if that’s not enough, there’s more Honda history here), you’ll also get more detailed thoughts from me about what the new Super Cub is like to ride. But, I get it. Sometimes reading is just too much work. Sometimes you’d just rather watch a video of a guy talking about a new model, why it’s important, and what it’s like to ride. Not only does this video of the new Super Cub give you that, it also includes Honda’s Collin Miller joining me to talk about the bike, as well as riding shots – including on-board footage of a rider (it may or may not be me) doing figure-eights aboard the Cub around some tables on the Redondo Beach pier, accompanied by none other than one of RB’s finest. It was a laugh fest, which embodies what the Super Cub is all about.